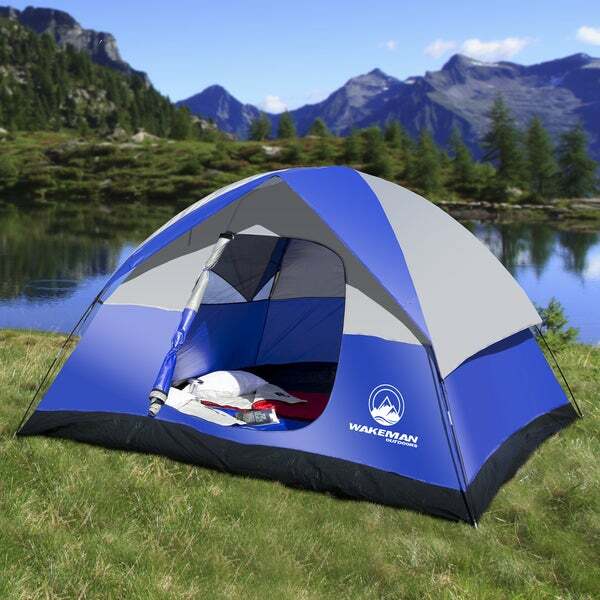 Make your camping adventure a pleasant and memorable one by bringing the 6-Person Tent By Wakeman Outdoors. This tent boasts a 10 by 10-foot base and a 6 foot center height for extra space and an interior storage pocket for your phone, flashlight, or other small camping gear. With the rain resistant coating and taped seams, this tent is a great 3-season option to easily set up, take down, and keep your time spent experiencing the outdoors. IMPORTANT: Avoid buying counterfeit products and transacting with unauthorized sellers. Look for our logo on the packaging for every one of our products. Wakeman Outdoors is committed to providing the consumer with the absolute best price and value on our entire line of products, which we ensure by applying a rigorous quality control process. Wakeman Outdoors is a registered trademark protected by U.S. Trademark law and will be vigorously defended. WATER RESISTANT MATERIAL- Keeping yourself, your camping equipment, and your personal items dry when you are camping is half the battle. The 190T polyester with polyurethanecoating on the tent body and the detachable rain fly help to ensure water does not make its way into the inside of your tent. Additionally, the taped seams offer rain proof protection for an enjoyable, and dry, trip. SPACIOUS AND CONVENIENT- This lightweight 6-person dome tent with a large D-style door was designed for comfort, space, and convenience. With an interior height of 6 feet and 10 foot x 10 foot dimensions, this is a roomy tent with plenty of space for you and your family or friends. The electric access port and interior storage pocket help to clear clutter and keep the inside the tent organized, providing an overall cozy experience. When you are finished with your trip, you can simply place the tent components back into the carrying bag to easily pack up and transport. GREAT FOR 3 SEASON USE- Get the most out of your tent during the year. The fiberglass poles and ventilation window allow you to utilize this tent in spring, summer, or fall (temperature dependent). So whether you need a tent for traveling, backpacking, hiking, going to a festival, or whether you are headed out for a weekend camping trip with family and friends, this is an ideal tent to fit your needs. PRODUCT DETAILS- Dimensions: 10’x10’, Interior Center Height: 6’ Materials: 190T Polyester with PU Coating, Floor Shell: 110g/M2 PE, Poles: Fiberglass, 9.5mm diameter, Mesh: B4 Black, Fits: 6 people, Includes: Portable storage bag and tent stakes. SATISFACTION GUARANTEED – Wakeman Outdoors is committed to providing consumers with the absolute best price and value on our entire line of products. NOTE: This is an exclusive product of Wakeman Outdoors and ONLY 6-Person Tents By Wakeman Outdoors are GUARANTEED to be genuine. Weight: 11 - 11.9 lbs. Weight 11 - 11.9 lbs. excellent all around outdoors camping tent for the family. Great! Very easy to put together. My husband had it set up in 5 minutes, with no help,(I’m disabled). We were able to fit a queen sized air mattress and still have a foot on either side of us for little stuff like a camping fan, lantern and cordage to charge our devices. We were also hit with extreme thunderstorms for a couple of hours each afternoon and the tent stayed bone dry. Our tent flaps were basically closed yet we still had airflow. This tent was perfect for the two of us and was a great value! We received this tent quickly and are using it at our campground site. It was super easy to put together and is well-made. The colors are as pictured on the site. The hardware is solid, everything fits together perfectly. Although this is a 6-person tent, I would say that it would sleep three comfortably with all their gear. We had two 14 year-olds sleep in it with sleeping bags and there was plenty of room left over for books, lanterns, drinks, etc. on the sides. A great deal, would purchase again. This purchase is to be a birthday gift around the 1st of April 2018, and was chosen based upon the reviews and star ratings along with a sale price, and as such has not yet been opened. Delivery was as agreed to. The only reason for a 4 vs 5 star rating is due to not yet viewing the product itself and trusting in previous reviews. This tent is very nice and was purchased in conjunction with a sleeping bag for my four year old son as a Christmas present. We live in SC so it definitely will be warm enough for camping out in the backyard which he has been asking to do. I love that it is water resistant and quite sturdy looking. There are only 3 of us so it will be larger than necessary so he’ll have room to play. I know he will love it and I love that I got it for a great price. Love the colors of this tent and the carrying bag. I bought it for the easy and fast component for putting it up which I tried at home. Have not taken it camping yet, but I will this summer. Would order again. We decided to start camping and this is a great starter tent. Easy to clean, assemble and break down. Had an unexpected rain in the middle of the night and the rain cover was easy to put on while we were half asleep. A really nice tent and a great price for the product. Cannot wait to go camping with it. Really easy set up and great for those who don’t know what they are doing. This tent was easy enough to put up but a bit difficult to secure to the center poles..After one gust of wind the corner tie down with the grommet, ripped right off the tent making it impossible to secure the corner to the ground. we didn't have any rain, therefore can not speak on water resistance. Was happy overall until the tie down ripped. 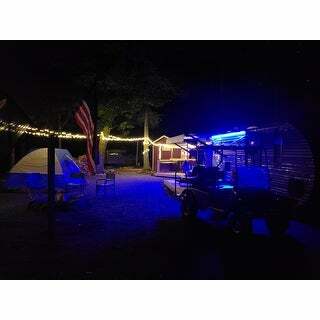 Great tent for my needs.it was easy to set up unlike many tents & color was great love the bright blue! Very nicely made from what we have been able to see. Since cold here in Idaho will be trying it out this summer. Like the fact that it can hold 6 people. Since we are a large family size of 6! Brought as a Christmas present. 12/11/2018 Very impressed with the speediness of the delivery . More room for the my wife and myself plus our dog. Camping Gear Buying Guide from Overstock.com. Our guides provide customers with information about camping gear. : Avoid buying counterfeit products and transacting with unauthorized sellers. Look for our logo on the packaging for every one of our products. Wakeman Outdoors is committed to providing the consumer with the absolute best price and value on our entire line of products, which we ensure by applying a rigorous quality control process. Wakeman Outdoors is a registered trademark protected by U.S. Trademark law and will be vigorously defended.